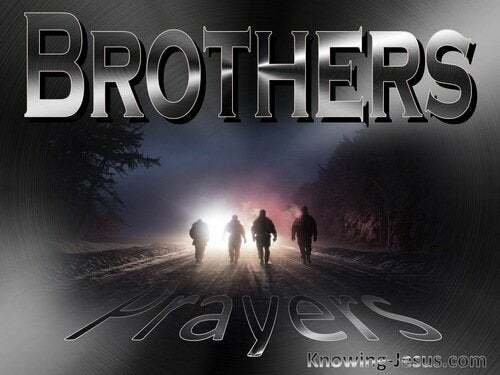 O God in Whom I trust, I bring my brother, who is in the military and far from home, before Your throne of grace and ask that You would help him to keep strong in the faith and to stand firm in the place to which You have called him to be. Give him courage and keep him safe I pray and may he hold fast to the word of truth , knowing that in all things we are more than conquerors, through Christ Jesus our Lord. I also ask Your protection over any who have fallen into the hands of the enemy and are being used as hostages or for political bargaining – I particularly am thinking of Bowe Bergdahl, the only American POW in Afghanistan, who has been in custody since June 2009 – give him courage and return him home to his family speedily, we pray. Dear Lord Jesus, I really want the very best for my younger brother – we had such a close bond as we grew up, and although I know that I was a bit ‘bossy’ at times - we are still very close to each other and I do thank You for the loving fellowship we continue to enjoy together - Thank You for placing us in our family units and for the loving home life I had as a child. Times have gotten hard for all of us Lord, and I know that things are not so good for my younger brother, either. I pray Lord, that You would meet him at his point of need and lift him up from the hard times we are all facing, and that is affecting his relationship with us all – and with You Lord as well. Thank You that You love my dear brother as much if not more than I do, and I pray that the joy of the Lord will once again be his strength, as it was before. Dear Lord Jesus, things have gone from bad to worse for my brother - and Lord we were so close as we grew up together, and it grieves me to see him so desperate and forlorn. He has turned to drugs and is going into the depths or despair and Lord Jesus, it pains me so much to see my lovely brother in such a sad and sorry state. Lord, we were raised to think that we would never get into heaven unless we were very good and did lots of good things – and we never understood that our sins have ALREADY been forgiven by the blood of Jesus and all we have to do is to trust in Jesus as Saviour to go to heaven – just simply trust that the Bible is true and that Jesus died on the cross to pay the price for the sins of the whole world, so that whoever believes in Him would not perish and go to hell - but would be saved by His blood and be given eternal life. Loving Lord I thank You for my brother – I love him dearly, but Lord I know that You care for him so much more that I ever could - for Your whole nature is bathed and brimming with perfect Love and deep Compassion. Heal my dear brother I pray, not only of his physical ailments that are bothering him at this time, but more importantly I pray that You would address his spiritual need. Lord he has played the fool with the good news of Salvation and wants to ‘enjoy life first, before he thinks about his eternal soul – but Father this is a dangerous game to play and I pray that in Your love and compassionate mercy You will convict Him of sin in his life, and the need for Salvation through Jesus Christ, Who is his only door into eternal life. Heavenly Father, thank You for all my brothers and sisters in Christ around the world, and that You have given us all a new life in Christ and have made us members of His Body – the church. It is wonderful to realise that I have members of my heavenly family in every corner of the world and that one-day we will all meet together, in heaven at the feet of Jesus - Praise Your name. Lord I also know that many, many Christians around the world are suffering severe persecution. Gross and wicked things are taking place to many who trust in Jesus as Saviour - and I know that it must break Your heart as it does mine when we hear of the terrible atrocities that are taking place in so many different countries. Father I pray that in Your mercy You will protect them from the evils of this world and be with them throughout all the terrible ordeals that so many are facing. Guard and guide them and keep them from harm and protect the children of our Christian brothers and sisters, that are so very vulnerable. And Lord, for those that face death for the name of Christ- give them, I pray the grace to know that You are with them every step of the way. May they all receive Your crown of life that is promised to all who give up their lives for the sake of Christ. I Prayed For This Prayed for 97 time. Please say a prayer for my brother (RUBEN TURNER) he's in third stage renal failure, any prayers would be appreciated! Lord please help my brother and help him through this, please hear my prayers. I Prayed For This Prayed for 58 time. Lord i pray to you for my brother judy. You know my brother so much better than I do. I put thee into your hands, guide him, bless him, strengthen him, and give the intelligence like David. Lord, please protect my brother, I believe you hear this earnest prayer from my heart and that it is powerful because of your promise. I have faith in you, Lord, to heal my brother I also trust in the plan you have for his life. Amen. I Prayed For This Prayed for 46 time. Lord I pray for my brother Richard who is fighting anxiety disorder and takes on the responsibility of taking care of my 89 year old mom. He has divorced twice and has two boys who are so in need of his love but cannot seem to wean himself from my mom who also has two other caretakers. He is financially distressed and has threatened to take his life.he has turned against his other siblings who try to give constructivecp criticism which he totally balks. Please open his heart and relieve him of distress. I Prayed For This Prayed for 563 time. I Prayed For This Prayed for 48 time. My little brother, I know you think I am being mean and cruel at this time, by trying to give you advise you do not want to hear right now. Just know that I want the best for you, and unfortunately, it hurts me to see you going the wrong direction, but being powerless to change your ways. Just know that I love you so much, even if you think me cold and distant. Lord, please protect my brother, I will follow your lead. Please let me be strong and do not allow sadness, disappointments, resentments to tear what is so precious. I Prayed For This Prayed for 61 time. Dear Lord, You know my brother so much better than I do. You know his sickness and the burden he carries. You also know his heart. Lord, I ask you to be with my brother now as you work in his life. Lord, let your will be done in my brothers life. If there is a sin that needs to be confessed and forgiven, please help him to see his need and confess. Lord, I pray for my brother just as your Word tells me to pray, for healing. I believe you hear this earnest prayer from my heart and that it is powerful because of your promise. I have faith in you, Lord, to heal my brother I also trust in the plan you have for his life. Lord, I don't always understand your ways. I don't know why my brother has to suffer, but I trust you. I ask that you look with mercy and grace toward my brother. Nourish his spirit and soul in this time of suffering and comfort him with your presence. Let my brother know you are there with him through this difficulty. Give him strength. And may you, through this difficulty, be glorified in his life and also in mine. Amen.